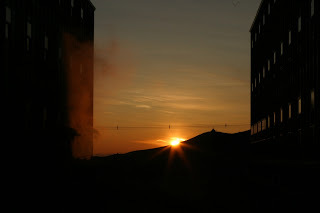 The first sunset of Winfly. At the end of summer, we all raised a glass to the start of winter. We quietly watched the last plane tip its wings before it flew north. We had a few days to contemplate the isolation we were about to begin facing. It was a nice slow gradual transition. The first plane of Winfly means the end of winter. The end of winter has come in a hurry and abruptly. There was no transition. The plane touched down at 1:34pm, the people came to town, and winter was very clearly over. No ceremony. No warning. Just boom. Done. People everywhere and a flurry of activity. I think some of us are whimpering. 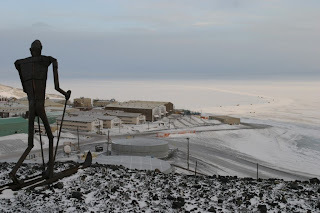 Overlooking McMurdo as the new people arrive. I guess there was warning. We've known the dates for months. I knew people were coming all along. I just didn't internalize how sudden it would be. I didn't realize that some of my friends were leaving. Lots of emotions from everyone on station. 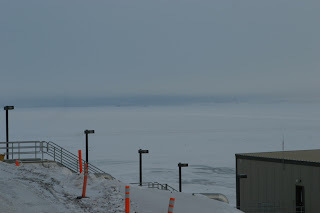 It is interesting to watch the reactions of people who have been wintering over. I've seen some have their eyes darting around the room like a hunted rabbit. I've watched people who didn't talk at all over the winter consider standing up for other winterovers for solidarity's sake. People call to get a phone number and ask for the number by first name, but the new person doesn't know who that is yet. That is weird. Chances are that someone else is answering the phone at the numbers we regularly call. It catches us by surprise. Some people are just overwhelmed by the noise. Some people are no longer eating in the galley to avoid the noise and new people. Other people call work centers and ask for winterovers by name so that they can talk to people they know. People who didn't eat together over the winter are suddenly eating meals together because the familiar face they know is better than the one they don't. These are just a few of the many examples of what is going on. I imagine a lot of the reactions are the same as what happens when a small town is invaded by the national media. The one major difference is that we have a lot of old friends coming back. 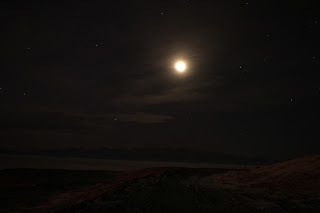 The moon over McMurdo Sound. I got to spend the night with a lot of those old friends at Katie Folts' birthday extravaganza. The USAP was nice enough to fly in 125 people to attend her birthday party. It was great to celebrate her birthday and reconnect with old friends. None of the new comers had to work the next day so they were more than happy to stay up late and celebrate. I ducked out of Katie’s birthday a little early. I heard it was probably going to be our last chance to see good auroras so I got my gear and went out. I was a little disappointed. 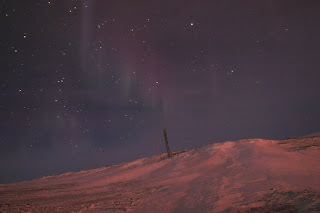 I could see the sky was clearly covered in auroras, but they were very faint due to the cloud cover and bright moon. It was still good to see them one last time. Winter is done. The dark is fading. Friends are leaving. Other friends are arriving. I'm anxious about what I am doing when I leave. I'm excited about the change of pace. Winter was good, but I'm excited for what is next. Brody - are you taking your Adderall down there?